First and foremost! I am SO IN LOVE!!! 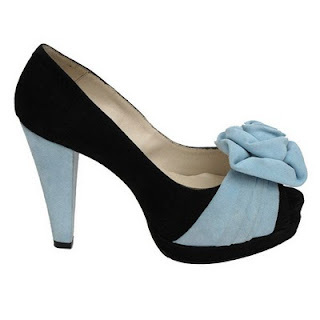 I just met these beautiful new shoes by Ann Roth, via skirt!, and I think I'm in love. Not with these shoes specifically, with all her shoes. These shoes are just amazing pieces of art. I can not wait to afford a pair. LOL! I LOVE shoes, but I can not bring myself to spend more than $100 for a pair. Even $100 is way too much for me. I usually stay in the $80 range. So Fall is here and I totally do not feel like it. I feel like something is off kilter. I know what it is. I don't feel like it's Fall because I'm not taking the kids to school every day or picking them up. Since Rey is still off, and doing all of that, I'm not following my school schedule. I don't feel as busy as I usually am when school starts, therefore I don't feel as useful. I still feel very lazy. I'm hoping that the start of Cheerleading classes tomorrow changes that a bit. I'm coming home a few minutes early to take the kids to their first cheerleading class. I'm watching this first class, but the plan is to work out every Tuesday while they are there. That's another thing! I haven't been working out and that has a lot to do with the laziness. Fall always marks the beginning of a new phase for me, like my birthday and a new year. It's a time that I use to reasses my life. It is so hard to believe that it has been 8 months since the start of the year and six months since my 40th birthday. Incredible... I have never felt quite right in these six months. I haven't felt like my life is in order. Something is definitely askew. Once again I'm also behind schedule. Instead of sitting down to revise my goals for the rest of the year and reviewing my five year plan before school started I am barely doing it this week. I never even made a vision board/bucket list. I kidded that I needed to make a love shrine instead. A love shrine to myself and my life. A definition of who I am and where I want to go. I hate it when I get this feeling that I'm just existing and not living. It isn't a good feeling and I must shake it off. Looking at the Emmy nominations makes me realize how little TV I watch. At first it was a conscious effort and then it just became the norm. I can actually count on one hand the number of shows I have watched on a regular basis in the last twenty years. Currently it's 30 Rock and NCIS. I love both those shows! I decided to go through the nominees for tonight's awards and I found that I have not watched any of the shows, mini-series, or made for TV movies that are being nominated. I wanted to watch The Closer every time I would watch the commercials at the gym, but I just never did. The commercials make it look really good! When I was growing up I lived with a sister who watched TV 24/7. I am not kidding. To the point that I did not want to watch TV for years. Once she moved away, when I was around 16, I stopped watching it all together. I read a lot and talked on the phone instead and then before I knew it I started college and I was too busy with studying to worry about it. During those years I probably only watched a Spanish novela or two with my mom during dinner. The summer I lived in St Pete, Florida while doing an internship I didn't even have a TV in my room. I know there are many people who do the same thing. I often hear people say they don't even own a TV and if they do it's only to watch DVDs. So this leads me to the question. How does TV even survive? Who is watching TV? With the Internet, Netflix, XBox TV shows, etc... who watches actual television with the commercials and all? Because that's how TV survives; from the advertising. If the advertisers aren't reaching their target audience and they aren't seeing an ROI on their investment (and TV is really expensive) they are going to quickly lose interest in advertising. If TV loses their advertisers they will lose more money and that is not a good thing for any media. 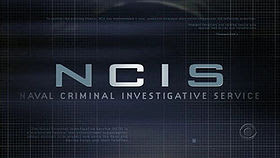 I started watching NCIS at the gym originally. I got caught up in some of the shows and then I saw that I could watch one of the seasons on Netflix without commercials. Since I was looking for a show to watch while I folded clothes I started watching Season 6 online on Netflix. When I finished watching those shows it was time to watch Season 7. And that's how I started watching the show on TV. Now that I think about it, that's how I started watching 30 Rock too. I watched the show on Netflix and then I moved on to television. However, I often DVR the shows and I watch them sans commercials. So is the Internet actually helping TV or hurting it? I wonder how how many people do the same thing. How many people start watching a show online and then move on to watch it in real time? For some reason the song lyrics, "Video killed the radio star," keep running through my head. Except my question is did the "Internet kill the TV Star?" I haven't decided if I'm watching the Emmy Awards yet. I may tune in just in time to see if Tina Fey and Alec Baldwin win in their category since they are the only two actors nominated who are in a show that I actually watch. In honor of my anniversary! I may have said this before on here, but I will say it again and I'll probably continue saying it my whole life because I can't believe how much I didn't think about it thirteen years ago. My wedding anniversary will forever fall at the start or around the start of the school year. Yes, today is my thirteen year anniversary and it also happens to be my kids' first day of school. I was feeling totally guilty for never taking a vacation day all summer long and then in the end I decided to just go ahead and take off the last Friday of the summer. I say I took the day off when in fact I logged on to work in the morning for a little while. After that we took the kids to see Nanny McPhee Returns. Very cute movie but we went to see it for the kids. That wouldn't be my first choice, but they enjoyed it. Then Saturday we took them to the beach and they had a really good time. I took today off too for our anniversary and for the first day of school. Rey and I decided to go see a movie we both wanted to see. So we took the kids to school, I came back and worked for a little while, took a nap, and then we went to see Salt. Great movie! Action movies with a strong female lead are always a great compromise. We both enjoyed it and I'm looking forward to the sequels I'm sure are to come. Then we had sushi for lunch and I told the Chinese waitress that always sees us there that it was our anniversary, but of course she didn't give us anything, not that I expected anything. But I couldn't help but think how different it is when you go to a nice restaurant and you tell them it's your anniversary. They always give you a little something, even if it's a free dessert. Not so at the Chinese buffet that is a great deal on freshly made sushi. I guess they figure we can just go get some ice cream from the buffet or some flan the Mexican cooks make. Maybe if I told them my blog is a channel for Chinese anti-communists they would have offered me something. I need to remember to mention that next time. So we've been married thirteen years. We are both very challenging personalities, thus the two children with the challenging personalities. We are not perfect. Who is? We both got into this thirteen years ago really not knowing what to expect. At least I didn't. I'd never been married, he had. And yet here we are thirteen years later for better or for worse and believe me, we've seen a lot of the worse of one another. Two children and two c-sections later we have survived. Yes, I should have come with a warning label! A few days ago we watched Date Night (yes, we watch a lot of movies, don't judge) and the two main characters, Tina Fey and Steve Carell had the exact same conversation that we have had before. It was hilarious! My husband says to me, "We've had that conversation before." And I said, "Thousands of couples have that conversation." I have seriously had that same fantasy of taking off and just checking into a hotel room à la Ashley Judd in Divine Secrets of the Ya Ya Sisterhood in my nightgown with a coat and a bottle of vodka in one hand. What woman or man hasn't? But most of us don't. We work out our differences for our children and for better or worse, just like we said in our wedding vows, and we move on. We can't afford to take sabbaticals like the character in Eat, Pray, Love. That's not reality for most of us. In an age when divorce is always the answer we have somehow managed to hang in there and make it work, and that has made all the difference. Hey! I Think I'm a Latina Blogger! Here's some interesting news! After six years of blogging here and on skirt! and also reading many other Latina's blogs over the years, word on the street is that there has been a "recent explosion of Latina bloggers on the web." Maybe no had noticed us all of this time, so I guess it's nice to know that we've "sparked a buzz of excitement through cyberspace." 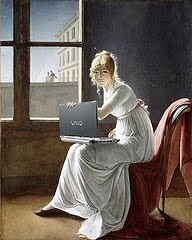 I enjoy blogging. Blogging for me is a weekly (and sometimes more) writing exercise. It gives me time to sit down and craft my words, however rudimentary. Sometimes I have the time to really go back and edit my work and sometimes I don't. Those times that I don't it's more like one of those 15 minute writing exercises where you are only allowed to write non-stop without any editing. Those are fun. It's always cool to see what you end up writing. So I keep blogging. I don't do it for the money, although I should add that option to my blog. I tried it once but didn't see much ad activity. I really just blog for the love of writing and to send my words out into cyberspace in hopes that I will touch someone and make them go, "hmmm," laugh, or to spark some memory of their own. It's all about the pen, or the keyboard in my case. Back to more Latinas blogging. There was actually a panel on this subject at the BlogHer conference. I've wanted to go to BlogHer for the last couple of years, since I first heard about it. I think I am really going to make an effort to go next year. What I found most interesting about this article was the statistic that "Hispanic women in the U.S. are one of the fastest-growing online demographics, and more than 85 percent of Latinas visit social networks on a regular basis." This is interesting to me, not only because I'm a Hispanic woman blogger, but also because I sell Hispanic media, including digital. This is great information for Hispanics as a viable digital market. There I go again! Always wearing both my writer and my advertising hat at the same time! Argh! Thus the reason why I don't write full time and I blog. This is what I've been writing other places when I'm not here. I have a week to finish "the talk" with my daughter. The birds and the bees in other words. Here is the story on that on skirt! Sopalatina.net, a really cool Latino web site posted this essay that I submitted about reading and what an important part it has played in my life. I went on a walk again through downtown and I decided it IS all about the architecture. 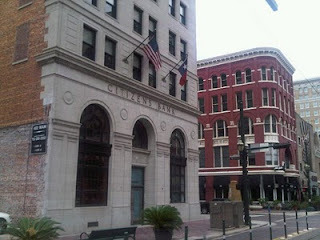 Citizens Bank at 402 Main, Built in 1925. I took the train again down to St. Joseph's to a sales call. Now that I knew the route it seemed a lot quicker. When I got to the Preston train platform I was right in front of these beautiful buildings. Just look at the designs. 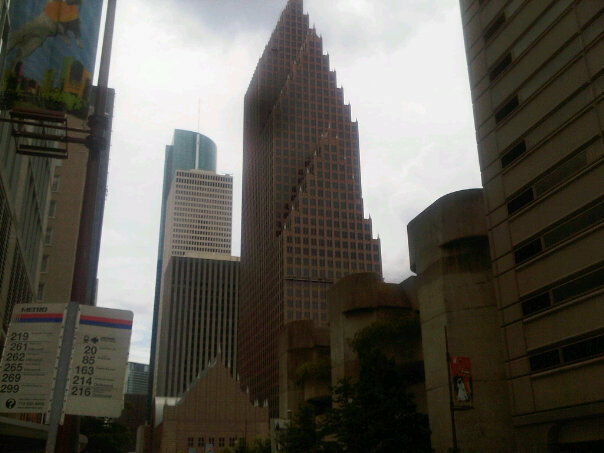 Houston has some of the most beautiful buildings. I'm so glad so many of these buildings have been marked as historical because that means they have a better chance of survival. The State National Building at 412 Main St. I love the small two story building next to it. I think it looks so unique there next to the taller building. 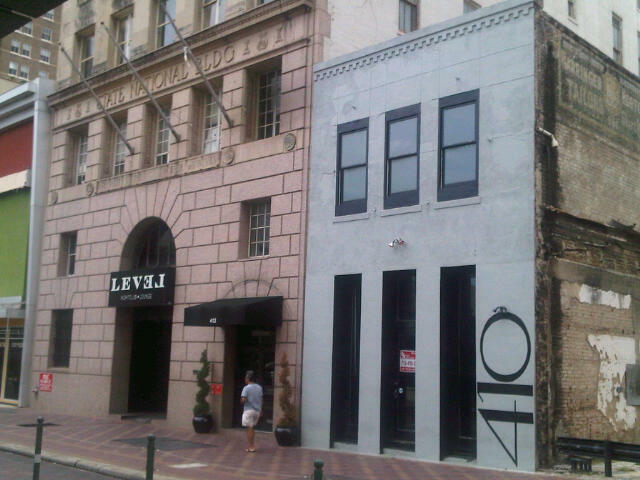 I would love to own that smaller building so I could convert it into my house. Yes, I would live downtown. 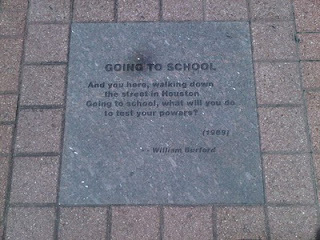 This time I stopped and took a picture of another Houston sidewalk sign. I found out earlier in the week that they aren't only on St. Joseph Pkwy. They're other places too. Then on my way back to the office I snapped a picture of the place where I should live. When I first started working at the Chronicle in 1993 the Rice was closed and there were rumors that it would be remodeled and changed into apartments. I used to joke that if that ever happened I would live right next door, roll out of bed in the morning and go to work. 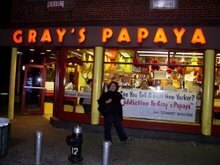 They didn't remodel and reopen it until 1998 and by then I was married and I was thinking of a house. What was I thinking? Now that I own a house I think about how much I would enjoy not having a yard. A couple of restaurants and a coffee shop have access to the Rice lobby and I think that's really cool. I love to sit in their beautiful lobby for lunch or for a coffee and imagine what the Rice was like back in its hey day. The artwork on the ceiling is breathtaking and if you sit really still you can almost hear the hustle and bustle of the original Rice Hotel. There used to be a jewelry store in the lobby, among other businesses, back then. The Rice was one of the places to be and many business deals were made in their bar. I also LOVE LOVE LOVE all the restaurants and bars downtown. I remember when I was in college and a few years right after college when my friends and I would go to a dance club downtown called PowerTools. It was so underground and grungy and we loved it. Back then there were no bars downtown except for PowerTools, the Brewery Tap and La Carafe. Now there are all these bars and restaurants. I love walking down Main St and seeing that we actually have pubs now! There's Molly's Pub and the pub attached to the Rice building, Shay McElroy's. It makes me feel so European! So I've decided that this is exactly what I was going to write about that day I fell. That and that I'm surprised at how many people take the light rail. I was coming back at lunch time Wednesday and a bunch of people were going into downtown for lunch. A lot! I had to stand on the way back and I had to hold on to the bar like I was on NY subway. Now about one other thing. BlogHer.com. I want to go one day. I say that every year, but I'm very serious this time. I feel like it always sneaks up an me and then it's like this weekend. I am going to write it in my calendar for next year and I'm going to write "plan for BlogHer" six months from now. I would love to attend all the sessions and to attend the parties with other bloggers. It's this weekend and I'm missing it. Next year! Houston Is So Cool but HOT! Since I had to blog on here about my big FALL, I didn't blog about Houston and all the quirky or interesting things I notice about it when I walk somewhere. I did blog about the architecture over on skirt! If you want to read more about that go on over to skirt! Yesterday I went around the corner to Pad Thai, a really good little Thai restaurant (and by little, I mean really narrow) on the ground floor of the Hogg Building. (I love the house at the top but I've never been in it, but would love to) I was walking back when I saw this beautiful view of one of my very favorite buildings downtown, the Bank of America building. I found that it has it's own Wikipedia page with all kinds of interesting tidbits. 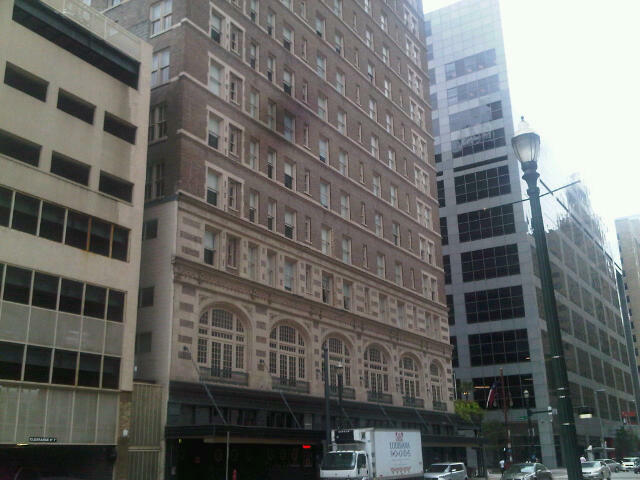 In fact, there's a whole page for Houston buildings, but some of the really old ones that I really like on Main Street aren't listed. Many of those even have historical markers on them. After I posted this picture on Facebook one of my friends, and one of the only workmates that I have as a friend on FB, stopped by my cubicle to ask me if I had taken that picture yesterday during lunch. She had commented on another photo that people who see me taking pictures probably think I'm a tourist. I joked that taking pictures was probably the reason I fell down. I'm off to pick up a check from a client downtown. Maybe I'll be inspired to write the original post I intended to write on Wednesday before I was side-tracked. This is fake grass y'all! 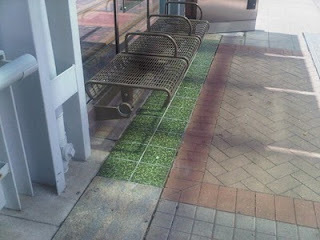 It's under the bench at the Metro Rail. Kind of creepy! 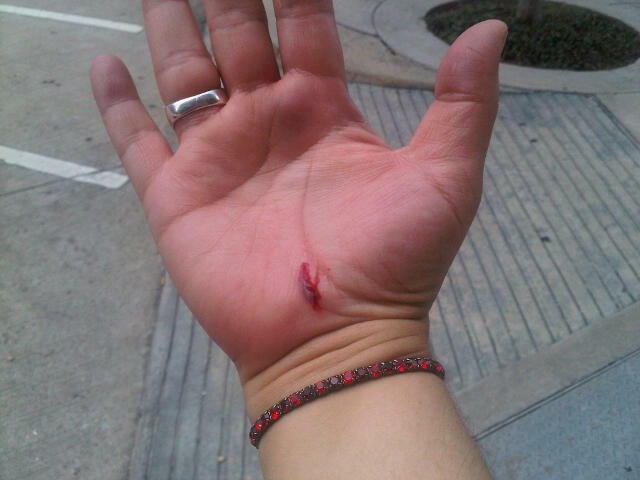 So today I decided to get brave and to venture out again on walking sales calls, despite the melting Houston heat. I took the train down to the Bell St exit and I walked over to a building on that end of Downtown. When I was coming back on the train I noticed something kind of weird. Under the benches they have pictures of grass. Is that strange or is it just me? I'm trying to understand their reasoning for that. 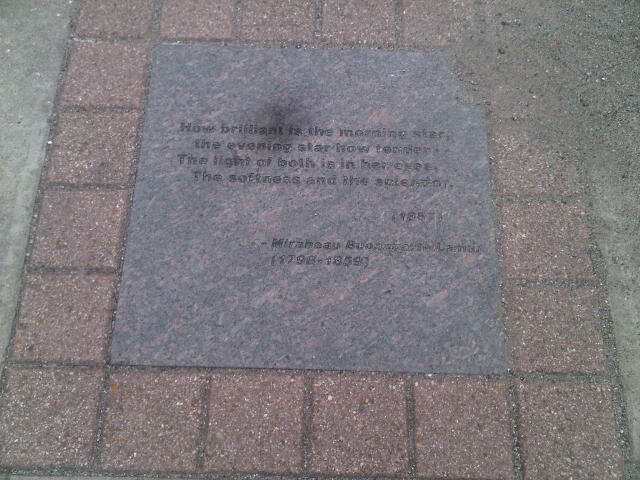 Then I started thinking about Houston and what a cool city it is. I started thinking of a list of things I was going to write about on here. Things that make Houston interesting or weird or maybe things I had never noticed about it before. So that's what I was thinking about all innocently as I left my last sales call when SPLAT! I lost my footing and my ankle twisted to one side and down I went on the sidewalk, hands out. Here is the damage. And here is the scene of the accident. 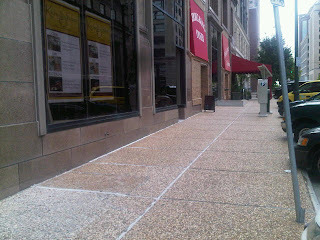 It happened on the corner of Franklin and Travis, right in front of the Hong Kong restaurant, well a door down. 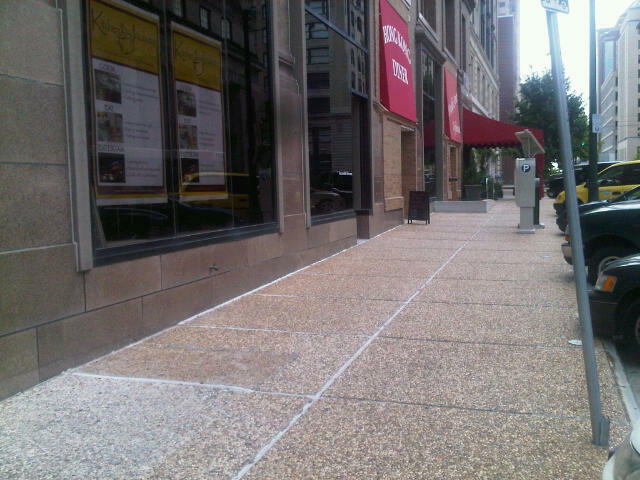 Notice the rocky sidewalk with those sharp little pebbles. One of those little pebbles tore open my hand nicely. At first I just sat there on that sidewalk you see here. I was mortified and embarrassed. All the cars at the light or passing by on Franklin saw me fall. One truck slowed down and I prayed that it wouldn't stop. So I just sat there and regained the little pride I had left and pushed up with my good hand. Now I don't have anything cool or weird to tell you about Houston except that Metro has pictures of grass under the benches at the Metro Rail platforms and it doesn't even make any kind of sense. If I had anything else to say I promptly forgot it all after my fall. What's funny is that when I posted my last blog on Facebook yesterday I said I was really looking forward to "fall." I totally meant the season and not a literal fall. I think my message got lost in translation somehow. And another thing that's really funny and ironic is that when I started my journey around Downtown this morning I was feeling so optimistic. 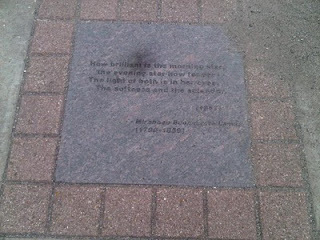 I was declaring my goals and aspirations out loud while walking down the sidewalk. (Yes, I probably sounded like those homeless people that talk to themselves, but "when in Rome," right?) I think that message also got lost in translation because instead of having wonderful positive things come back to me I was splattered all over the sidewalk only an hour later. My post on interesting little things I've noticed about Downtown Houston will have to be saved for later. It is hotter than heck in Houston right now. I have been getting out on sales calls and the heat is intense. Yesterday I got the bright idea of taking the train down to a sales call on the other end of downtown but soon realized it wasn't such a great idea. First I had to walk one block down to Main St and then one more block down to the train platform. Once I got off at my stop, which I must admit I arrived to really fast, I had to walk three blocks to the building. When I got there I was sweating! I had to stop off in the restroom to wipe my face and to cool down. And I was wearing a cotton t-shirt and skirt! Imagine if I was wearing a suit. It is just too hot right now in Houston for anything like that. While on my walk down the sidewalk I noticed a couple of interesting messages. Here is one. I passed another one, but I was too hot to stop and take a picture. They were on St. Joseph Parkway. 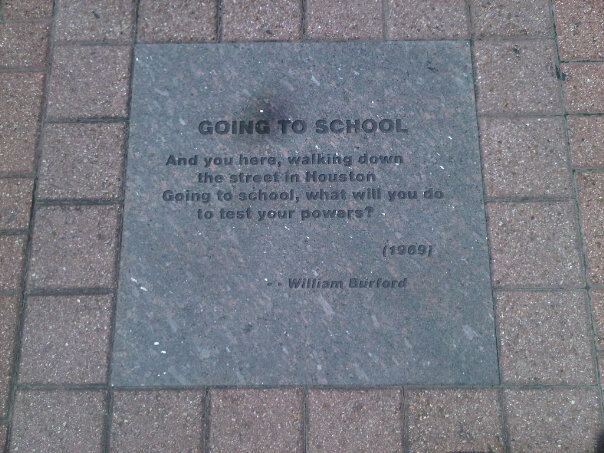 I have no idea who William Burford is and when I tried to Google him nothing popped out at me. The Chinese are still coming by to visit my blog and I've received two contradicting messages. I think one is from the Communists and the other is from my friends. The Communists say, "A friend to everybody is a friend to nobody." What's that? A warning because I'm letting people use my blog as a channel? My friends said in Chinese and I translated it, "Like it here - Support your update." Nice message guys! I'm glad you like it here too. It's been my online home for almost six years now. The end of the heat also means the end of the summer and this has been one lazy summer! I'm almost glad the kids are going back to school because it will put us all back on some kind of schedule. I've already started trying to put them on a schedule, giving them a check off list they need to work on each day. It includes the norm, like wash your face and brush your teeth and moves on to more specific things like get exercise and work on your math. They also need to start going to bed early and waking up early. They've been at home this summer with Daddy so they haven't even had to wake up early. One very hard decision I have had to make is to pull down my Hips 'n Salsa blog. I'm not really pulling it down all together, but I'm not going to update it on a regular basis any more and I'm not going to list it on the Latina Lista website as a partner. I just don't feel like it's fair to Latina Lista if I'm not updating regularly. So there you go. I had to let go of one thing to make room for other things. I read this quote this week and I feel like it is very fitting for me and my writing. I must get organized in order to do really great work. I want to enter some writing contests, more for the discipline and so that I will make the time to write, than to win. Entering a contest gives me a deadline. August 30 is my next one! "Be steady and well-ordered in your life so that you can be fierce and original in your work." -Gustave Flaubert. Sorry William, I think I like Gustave's quote a bit more.